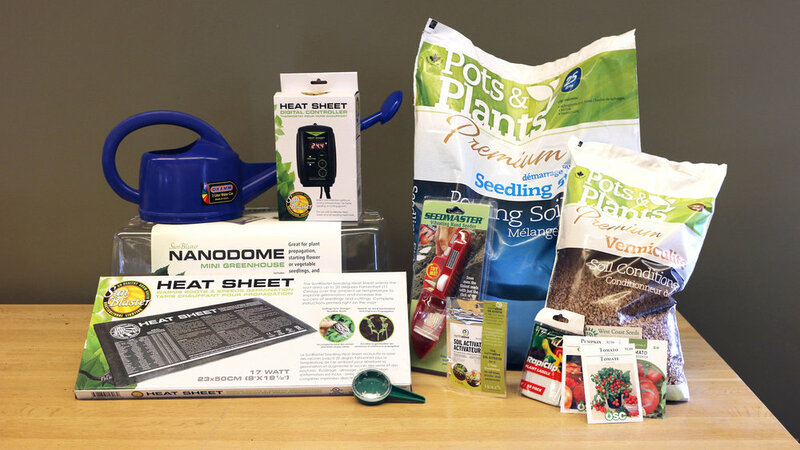 All the tools you need to get your seeds started indoors. 1. Seeds - First of all: you'll want to pick out your seeds (check out our complete seed list). Some of my favourites to start indoors are peppers, begonias, and tomatoes. While you're shopping, you can also pick up the seeds that are to be planted directly outdoors like carrots, peas, and beans. This way you can make sure you have them before they sell out in April and May. Next: check when is the best time to plant your indoor seeds (get our Edmonton and Area Zone 4A Seeding Calendar). Finally, if you're using seeds from previous years, remember that some seeds such as onions or parsley lose their viability after a year and should be replaced while some seeds remain viable for many years. Check the expiry date on your seed packets to be sure, or check with the staff at the greenhouse if some seed packets don't have an expiry date listed. 2. Seedling Starter Mix - A good quality seed starting mix is key. The grind or particle-size should be nice and small, not big and chunky. A mix with big particles is not ideal for small seeds or seedlings as many will fall through the gaps, plant themselves too deeply into the mixture, and never manage to make it to the surface. It is also a good idea to buy pasteurized seed-starting mixes to ensure there are no insects in your soil. 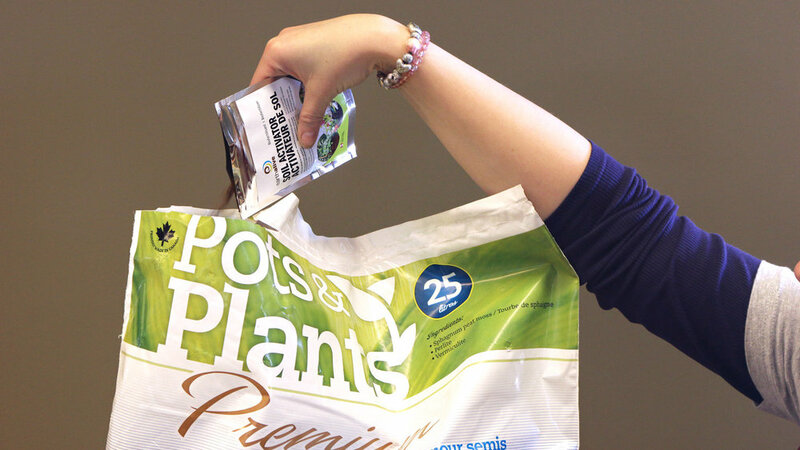 Pasteurized seed starting mixes will usually say right on the bag that they have been pasteurized (or "sterilized"). In the greenhouse, we sell a 100% organic brand called Pots and Plants. 3. Earth Alive Soil Activator - This "pro-biotic" for your soil is excellent to add to your seedling mix before planting, resulting is healthier plants and seedlings. 4. Clean Plastic Flats - These will be the flats into which you'll put your seed starting mix and into which you'll plant your seeds. Ensure that they are well cleaned to ensure that no fungi or insects are introduced into your growing environment. Wiping your flats clean and spraying them with a mild bleach solution will work if you're reusing flats from last year. 5. Cover It Up! - A good plastic cover will keep moisture and heat in for the plants. Personally, my favourite type of covers are the big tall greenhouse domes we sell here in the store because they keep moisture from escaping, can accommodate larger plants, and can even have a growlight incorporated right into them. 6. Let There Be Light - Speaking of growlights, you'll want some growlights to ensure that your plants grow vigorously, with strong stems, and lots of leafy growth. If you start your plants indoors without a growlight, they can become very tall and stretched out, without many leaves. This is because they are searching for the sun. Pro-tip: Cover numbers 4, 5 & 6 with a Nandome: Mini Greenhouse. This kit includes your seeding flat, plastic greenhouse dome with vents and a Sunblaster growlight that fits perfectly on the dome. Simple! 7. Plant Tags - Alright, so you've planted your seeds in a good seed starting mix in clean plastic flats. Now you have to remember what's where. Tag your rows of seeds or your flats of plants so that you can remember what's planted where. 8. A Misting Bottle - is the perfect way to moisten your seeds and soil. I like to give everything a good thorough misting on Day 1. A couple of days later, if you notice the top of the soil drying out, just give it another quick mist to keep the soil moist. This ensures that your seeds will germinate. I find that a mister is much better than a watering can for starting seeds because a mister keeps your seeds evenly moist rather than unevenly soggy. 9. A Germination Mat - Placed underneath your plastic flats, a germination mat creates warmth that simulates the Earth's natural ground heat. This stimulates your seeds to grow and increases their germination rate dramatically. A germination mat is a complete game changer for most home gardeners, bringing their gardening game and success rate up a full level. We have a variety of different sizes of germination mats here in the greenhouse, and many of our seed starting kits even come with a germination mat included. 10. Soil Thermometer - A soil thermometer is one last great tool. This will let you check on your soil temperature, and let you know if your soil is warm enough for ideal germination rates. Most seeds will germinate anywhere between 5 to 32°C (and even 43°C in a few exceptional cases), but the ideal soil temperature for most seeds to germinate is in a much narrower ranger of between 21-28°C. To maximize your germination rates, a soil thermometer is invaluable.